Our interview with “A Couple of Trainers” creators Devin Wiggins & Meagan Fulps. Devin is a seasoned movement specialist and Meagan is a former professional athlete. Together, with their knowledge, experience, and passion, they hope to inspire and guide people to reach and maintain their personal goals. Hi Meagan & Devin, please tell us a little about yourselves? Hi! We’re Meagan and Devin, also known as A Couple Of Trainers! We’re two fitness professionals and yes, we’re a couple. Devin is a seasoned trainer at Rise Movement and Meagan is a former professional basketball player. We both currently reside in Los Angeles where we met, yet we both grew up a mile away from each other in the small suburb of Highlands Ranch, Colorado. Fate exists, people! Haha. We went to rival high schools, have tons of mutual friends and our families don’t live far from each other. Makes holidays easy! DEVIN: My father because every pivotal decision I’ve had to make in life has come from a lesson he’s taught me. MEAGAN: Both my parents! My mother taught me love and how to be independent. She’s showed me nothing but support and encouragement. My father taught me how to be efficient and manage my time well. I definitely got both my techy and athletic side from him! How and when did you start working in fitness? Devin was intrigued by fitness at an early age when his father forced him to lift weights at the “prime” age of 9. He then decided to major in health and exercise science. Meagan has been an athlete since she could walk, having pursued basketball all the way to the professional level. She tore her ACL that ended her career, but shortly after that sought out training. One of Devin’s strengths is his thirst for knowledge. He’s always wanting to better himself. This also makes him an incredible listener. One of Meagan’s strengths is that she’s relentless. When she wants something happen, she will make it happen. Best advice you have followed? There are always going to be things that make you upset. Whether you personally fail or it’s rooted from an outside source. Allow yourself to be upset for 24 hours… and then get over it! Now tell us about your project “A Couple Of Trainers”? Earlier this year we we decided to join forces creating our own fitness company hoping to help others reach their goals in the most fun way possible. More often than not, we went to studios and saw so many people in their own heads. They didn’t talk to anyone and definitely weren’t having fun. We knew there was a way to change that, and it all starts with a true community. When we both played on sports team, the grueling workouts we went through were bareable and even fun because we experienced it with us. Sometimes you just need that person to complain to, laugh at, push, etc.! So from this, our brand and company developed! While Field Days and the Dash have been focuses for now, we still train often and really want to push more for couples training! 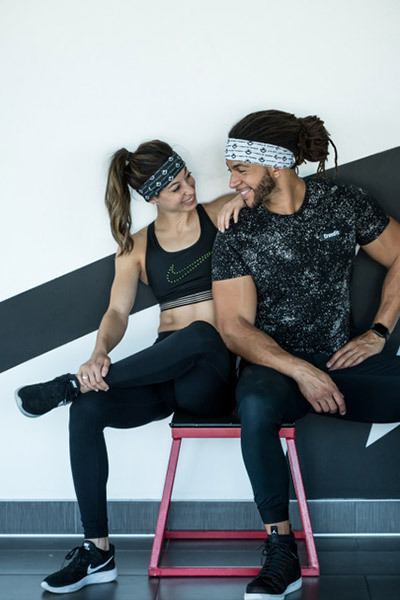 We think it’s such a great way for engaged couples to train together for their big day, but still have the individual attention of their own trainer. We will keep it fresh too — of course having our gym days, but then we like to get outdoors and go hike and run stairs. It’s fun for our clients and fun for us too! We are just building our double dating repertoire haha. Why did you decide to be an entrepreneur? We both have had our fair share of great and not so great bosses. Always learning what we can take away and what we could do better. Then there became a time when we saw a need in the fitness industry and we decided to do something about it. That need being “fun” and community. Like we touched upon above, we’ve visited so many studios and it was alarming how so many people come into a class and don’t speak or even look at anyone else. So many people are in their own heads and didn’t seem to enjoy being there. We knew we wanted to do something about this. Additionally, we both were really excited to build a business together. We both are constantly working and our time soon became limited, and this was a great to grow together and maximize that time. Life goes by quick, so we wanted to make the most of it together! What has been the more challenging part about this? Building a business takes both time and money. Yet, in order to fund a business you have to work — so essentially we’re both putting in the time for two full time jobs. It is totally exhausting! The balance can be hard and something will always be sacrificed. Yet, we have each other to depend on and we truly love what we’re building! How is working along Devin Wiggins on this? I couldn’t imagine having a better partner in crime!! Devin is very encouraging and the calming presence I always need. I definitely can get worked up about things and he’s always there to listen and bring my senses back. He’s also incredibly intelligent and the most modest individual I’ve ever met. I have to force him to take credit for things sometimes! Haha. I’m truly blessed to have such an amazing partner in business and in life! MEAGAN: Poached eggs on top of sauteed veggies! DEVIN: Vanilla ice cream wedged between two caramel pecan cookies from Milk Jar. Travel all around the world for work! Bring our events to everyone! There are so many tips and helpful suggestions we could recommend, but if you take away anything it’s go get yourself a FIT FAM! Working out with someone else is the best way to get results and enjoy the process. Sometimes you just need someone to complain through the pain with, and also someone to keep you accountable! We will have a strong online presence offering tons of online workout content. With training, there are only so many people you can see in a day, there’s a ceiling… but with online content we can reach way more people and have a greater impact. We will also be traveling the world taking our Field Day Dash all over. Make it a fun, crazy, challenging fitness event that everyone looks forward to every year. We love traveling, so it would be awesome to travel together for work. Lastly, we will have our own home base to keep training privates and small group classes. MEAGAN: I really love Alex Silver-Fagan! She’s a trainer and fitness model, and she actually resembles (and is) a real athlete! She’s strong and looks strong. Too many models are stick thin. MEAGAN: I don’t wear make-up really! The most would be a little mascara and eyeliner. We like almost everything! Right now, Devin is really into indie/folk and Meagan is really into EDM. And Justin Bieber, cause… duh. We have so many exciting things coming in the new year! New workout videos, Field Days at new spaces and another epic Field Day Dash! All the proceeds from our last Field Day Dash went to Puerto Rico hurricane relief organizations! There are so many things going on in the world right now and we’re happy to help in anyway possible. Having zero plans, laying on the couch watching Netflix and ordering in Chinese food. Devin by nature hates it. Haha. He’s not a social media person! Meagan enjoys it, but is realizing how big of a beast it is when starting a business! There’s so much strategy and it’s surprising really time consuming. Yet, it’s been great for our business and has helped us get our name out. We’re actively on Instagram: @acoupleoftrainers and you can also visit our website for more: acoupleoftrainers.com!